❏ The Royal Enclosure is the top of the range option, giving you access to all the best viewing areas and facilities on the course. Formal day wear is a requirement. 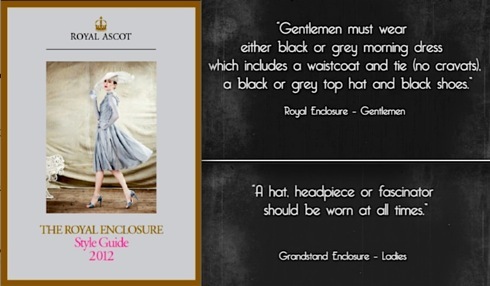 ❏ The Grandstand Admission ticket at Royal Ascot provides similar access facilities to those offered throughout the year. Dress in a manner as befits a formal occasion. ❏ The Silver Ring at Royal Ascot is a separate admission area that does not provide access to the Parade Ring or the main Grandstand. Bare chests are not permitted at any time. This entry was posted in Fashion, London, Media, Social trends and tagged dress code, eitquette, racing, Royal Ascot, Video. Bookmark the permalink.